Singapore’s citizen population is shrinking. A Total Fertility Rate (TFR) of 2.1 would allow the population to stabilize – our TFR is currently 1.2. The government has tried almost everything to spur couples to “action”: from traditional incentives such as cash, health benefits, and parental leave, to not-so-traditional messaging strategies such as the fertility fairytale. However, in spite of these ingenious interventions, our TFR has still declined precipitously over the last decade with little sign of reversal. Even Mentos has picked up on our dire situation with its infamous ‘National Night’ video. Is there anything else we can do? Or is this just an unsolvable problem faced by all developed countries? Cheryl Sim investigates whether a better understanding of the psychology behind having children holds the answer to Singapore’s falling birth rate. Her findings suggest a novel direction for our fertility policy. What affects the decision to have a child? It is commonly assumed that the high cost of having a child is the main reason why Singaporeans avoid having children. If this were true, then the solution should be as simple as providing cash incentives or cost subsidies to potential parents. But is it? Cheryl’s study looks at a couple’s “fertility intentions”, which are the number of children couples want to have and when they want to have them. She first tests our old assumptions. She looks at whether decisions are affected by a set of background variables commonly used to explain Singapore’s low fertility rate, such as income, age and so on. For example, we usually think that high-income women intend to have fewer children. She then offers an alternative explanation. She examines if our decision to have a child is not just a rational cost-benefit analysis, but rather one that is influenced by “behavioural heuristics”. Behavioural heuristics refer to the effects of psychological, social, and emotional factors on the decision-making process beyond strictly rational cost-benefit assessments. The figure below summarizes the range of factors influencing fertility intentions. Background and behavioural factors can directly affect fertility intentions. 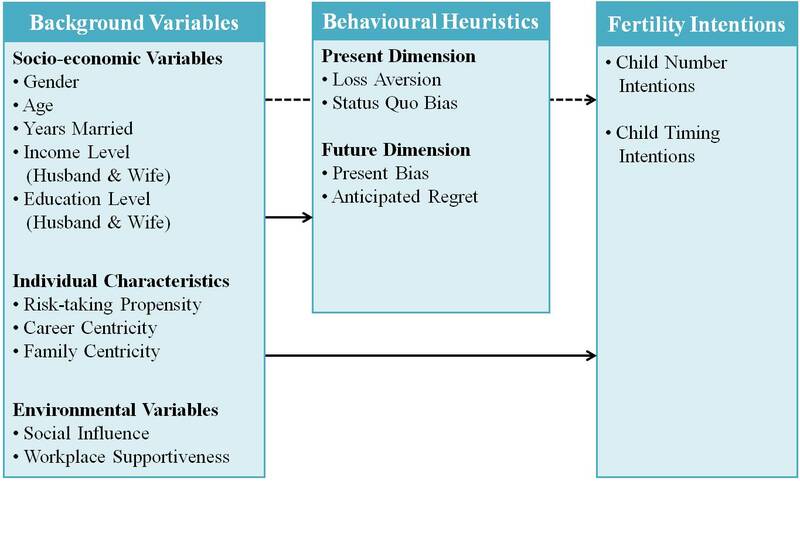 However, people of different ages, genders, and other backgrounds may also use behavioural heuristics differently in making their fertility decisions. One argument we often hear is that wealthier or more educated Singaporeans value having children less. Cheryl’s study debunks this idea. Singaporeans across income and educational backgrounds in fact want the same number of children. Backgrounds only matter for when a couple has kids. All else being equal, richer women and more educated men are more likely to wait to have children. Behavioural factors also give us a whole new layer of understanding of what is going on. The real reason why Singaporeans postpone having children is because we think that having children in future will cost less than it does now. This is a mistake: the cost of living actually increases over time. But as psychologists have long known, people tend to over-discount costs that are in the future. This is what ends up convincing us to wait. It gets even more interesting. Different sorts of people make this mistake. High-earning women (up to a point) make the mistake. But the same is not true of high-earning men; rather, it is lower income men who postpone having kids for that reason. Given that having children is a joint decision, this could explain why both high and low income couples end up postponing having kids. Waiting has serious consequences. Cheryl finds that people who don’t have kids early in their marriage are more likely to end up childless eventually. So it could be that couples who postpone having children end up waiting until it is too late. While costs are important, the perception of costs is the key factor that needs to be addressed. Monetary incentives may change actual costs, but might not change the perceptions of costs in peoples’ minds. In fact, such incentives could even backfire because they encourage the perception that having a baby is expensive. The solution is to help offset expenses without reminding people of costs. Non-monetary solutions, such as creating supportive workplace environments for mothers, may do this. Most messaging so far has focused on the importance of having a child or doing a national “duty”. But Cheryl’s study shows that most Singaporeans already think that having a child is important. No wonder, then, that past campaigns have been ineffective. They have tackled the wrong problem. The real problem is that people underestimate how much it will cost to have kids in future, and overestimate how much it costs now. So a more effective campaign would help couples figure out how much having a kid really costs. Cheryl tested an interesting way to help couples do so. She asked people to actually break down the different costs for having a child. After doing so, respondents reduced their cost estimates. There is no one-size-fits all message that will work. We saw that behavioural heuristics have different effects depending on gender and income. So we should target separate messages at low earning men and high earning women. This article snapshot was prepared by the editorial team. It was based on a final year thesis at the National University of Singapore written by Cheryl Sim, who received First Class Honours for her work. For more insights and nuance, please see the academic summary and full paper.